Relatives: Widow, Mrs Wormald, St Margarets, 1 Campbell Road, West Croydon. Henry Dakin Josling was entitled to the above three medals; 1915 Star, British War Medal and the British Victory Medal. The whereabouts of Lance Corporal Beer's actual medals is currently unknown. The name Henry Joslyn is listed on the Hadleigh great war memorial. However, this is spelt wrong and this is a good example of how the spelling of names during the great war period could be very unreliable. You will see in this story that Harry’s name is spelt at least three different ways. We will remember Henry Dakin Josling, which is the name on his family had engraved on his grave stone. When Henry Josling died, Hadleigh lost a true hero. Henry was born in George St in 1873. His mothers maiden name was Dakin. The BMD records show him being born 2nd Qtr 1879 Cosford. He appears in the 1891 census with parents born Lavenham. In the 1911 census he is listed as Harry Dakin Josling aged 32. At that time he is a Sgt instructor to a Heavy Battery, Royal Garrison Artillery (RGA), a territorial unit based at Stoke on Trent. The census show his place of birth as Hadleigh, Suffolk. An article in the Suffolk Free Press of 18 August 1915 refers to a Sgt Major Harry Joslin of the Royal Garrison Artillery and amongst other things it mentions that had he lived until November he would have completed 21 years in the army. So he must have joined up around 1894. He may have served in the Boer War but we have not yet found evidence of that. Henry's head stone on the right immediately above the CWGC sign. SFP article giving a graphic account of Henry's rescue attempt. Henry Dakin Josling is listed by the CWGC as Josling, H. Sgt 8554. Henry was in the 123 Heavy Battery of the Royal Garrison Artillery (RGA) who died 9 August 1915 and was buried at Manor Park Cemetery (Soldier's Corner). The Suffolk Free Press article says that prior to his death, he had been moved between various hospitals for thirteen weeks so that puts the date of being wounded to around the end of April 1915. His head stone refers to 'Hill 60'. Hill 60 featured in the Second Battle of Ypres which started on the 22 April 1915. The article also gives a graphic description of the moment when Harry was wounded while he was rescuing a fallen comrade. 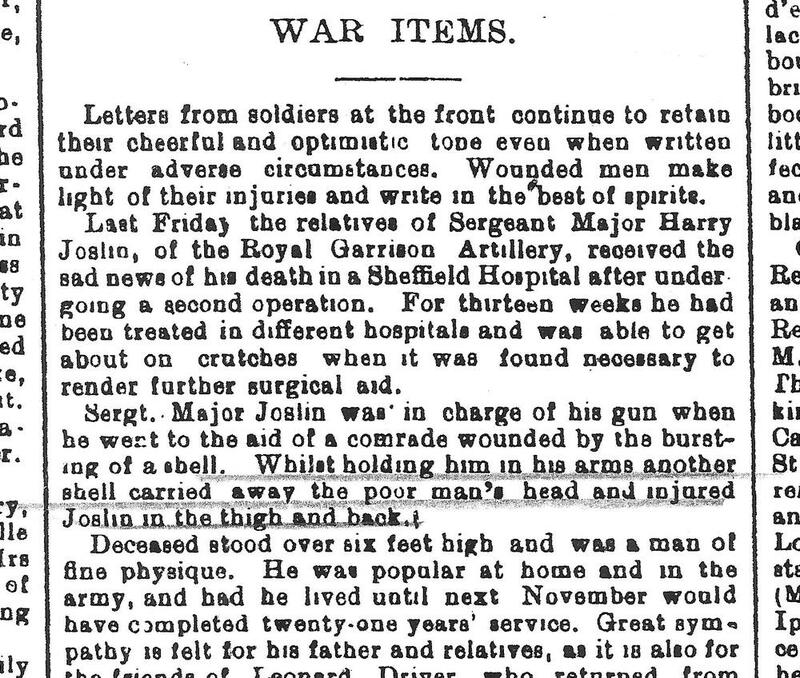 The press report shows him dying in Sheffield Hospital. His wife lived in West Croydon, which might explain why he was buried in London rather than Yorkshire. The inscription on Henry's head stone also refers to the rescue attempt. The headstone says that he died from wounds received at Hill 60. It also says that he gave his life rescuing a comrade. We do not know exactly where Henry was wounded, however according to the order of battle on the 22 April 1915 the 123rd Heavy Battery was south east of Potijze with 4.7 Howitzers. Potijze is a small village located about 1.5km to the East of Ypres and it is about 5km North of Hill 60. So it unlikely that he was actually at Hill 60. It is more likely that his battery was supporting the British attack on Hill 60 from Potijze. On that same day the Germans launched their own offensive attacking the Ypres Salient from the North East and it was during this offensive that the Germans used poison gas for the first time. The whole of the Ypres Salient would have been involved in action in one way or another on that day, even in the area of Potijze. We hope that this page has been able to tell the story of Henry Dakin Josling. If you know of any information which might help to add to the story then please get in touch.